NEW YORK, NY -- (MARKET WIRE) -- April 20, 2007 -- More prevalent than cancer or diabetes, mental illness ranks first among those causing disability in the United States, with depression and alcohol disorders alone costing employers more than $265 billion annually. The Department of Psychiatry at St. Luke's and Roosevelt Hospitals will address these issues and more in a live web-cast Tuesday, May 15th at 7:00 pm from St. Luke's Hospital. Aimed at raising awareness among the community of the prevalence and treatability of mental health disorders, the program hopes to de-stigmatize and debunk myths surrounding these issues through open discussion and education. The live webcast on www.or-live.com will focus primarily on three of the most common mental health afflictions, including anxiety, mood disorders and substance abuse -- three illnesses which touch an extraordinary amount of lives. In any given year, 11% of the population, age 18 and over, will suffer from some form of anxiety, while 9% will face a mood disorder such as depression. Another 9% will struggle with addiction. As with any illness, it is not only those stricken that suffer, but also their family, friends and colleagues. A panel of clinicians has been assembled -- along with patients -- to discuss their experiences in treating, living with, and overcoming their illnesses. Included in the expert panel are Dr. Richard Rosenthal, Chairman of Psychiatry at St. Luke's Roosevelt, Dr. Petros Levounis, Director of the Addiction Institute on New York, Dr. Galina Mindlin, The Department of Psychiatry at St. Luke's and Roosevelt Hospitals, and psychiatric nurse practitioner Jeanne Cummings. The group will also participate in an email session, to answer any questions viewers may have regarding these and other related topics. Additionally the program will feature a man-on-the-street segment, during which randomly selected individuals will be asked their opinions on various topics related to mental health. The purpose of the segment is to dispel myths commonly associated with mental health, in order to give people a better understanding of these issues. 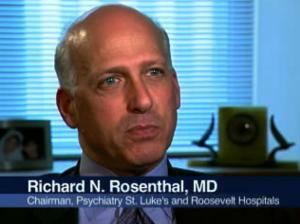 The Department of Psychiatry at St. Luke's-Roosevelt Hospital Center is committed to comprehensive and compassionate care for all its patients. The department has 162 inpatient beds, and provides a wide array of inpatient and outpatient services over two clinical campuses. Programs are integrated to ensure patients' individualized attention and treatment planning. Our quality inpatient and outpatient, and our fully accredited residency training programs in psychiatry and psychology, contribute substantially to the community's mental health resources.